Let's analize our human body. We distinguish in it several organs, systems that interact in a wonderful way. Substances exists in solid, liquid or gas form. Also there is a mental part that is based, in its physical aspect, in the brain and an emotional-sensory part that is based in our cardiac area. We speak of a "emotional-sensory" part because we want to include no only emotions but also sensations. We know that we receive "energy" for our own life and for all the planet from the Sun. We also exchange energy (vibrations) with the enviroment in which we live. Haven't you felt an impact in the upper part of our stomach when you enter a place that has a heavy atmosphere? Haven't you felt affinity or aversion inmediatly when meeting people? These are examples of the permanent vibratory exchange that we make with our enviroment. Where does the energy penetrate our bodies?. Which is the medium through which it expands inside our body and reaches every cell? How do we exchange energy with our surroundings? To be able to analyze these questions we should start by analysing energy or vibration itself, something that is not easy to do from the point of view of our western culture since, in this part of the globe, physics are treated as an inductive science that does not admit philosophical aspects or axioms. The ethimology of the word comes from the greek "energas", that means "active", that is to say that energy or vibration implies activity or movement. From the point of view of the eastern cultures energy has been admitted as a "principle" since the most remote ages, giving it the name "Prana" whose energetic manifestations are subproducts of that essential, ubiquitous "Prana" that penetrates everything. We will establish a series of analogies for the different manifestations of energy. Energy can take many forms. Examine the example of the information exchange between computers through the telephone lines (Internet, etc). 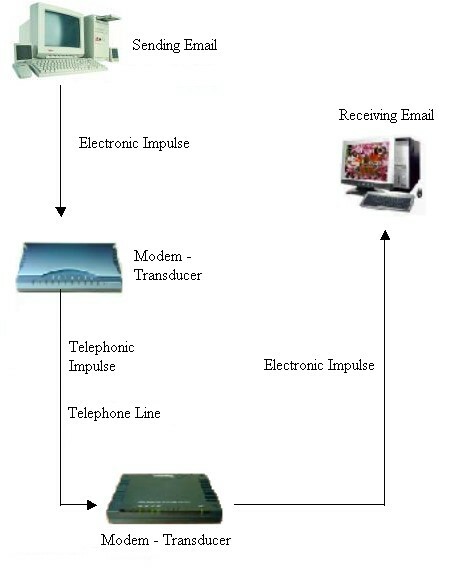 The source computer generates some information, an email for instance, then sends electronic pulses (vibration or energy) which is transformed by a modem (modulator - demodulator or transducer) into a telephone pulse that travels through the network until it reaches the receptor computer that represents them in its screen, thus receiving the email. The reply produces the same process in return. Figure 1. Recorders receive mechanic energy, an acoustic wave, that is transformed into an electric current by a microphone. So this acoustic wave goes through a device that transforms energy, more techincally speaking, a transducer. Acoustic energy, after propagating through an elastic medium (air, in this case) actuates over the microphone, that changes the mechanical stimulus (acoustic wave) into a proportional amount of electric energy. It is the same energy, but transformed. once inside the recorder this energy, in the form of an electric current, actuates over a magnetic circuit, undergoes another transformation, and another transducer. This magnetic energy, finally prints on a tape made of a material sensitive to it and records according to the stimulus applied. In this way the message is printed and stored. Transducer: Device that receives energy (electric, acoustic, mechanic, etc) from one or more systems or transmission agents and then produces another different kind of energy, that is proportional to the incoming energy that is in turn relayed to another system or transmission agent. There are a great number of energetic or vibratory phenomenons that are in fact multiple conversions of only one energy or vibration that can be found under many forms: chemical, thermal, luminous, or combinatios thereof, fuels, etc. The important thing is that all transformations start in a unique element: energy itselt, qualified according to its current manifestation. In western physics there were contradictions derived from two aspects of the same reality: the famous problem of matter against energy. In classical physics they appeared as two different elements, that have now been unified because of scientific research. Particulary by Einstein's work who discovered that they are interchangable, two aspects of the same thing, and could derive the formula in mathematic terms. Intuitively, understanding that every piece of matter contains energy is easy. Albert Einstein makes an appearance with a theory that revolutionized science. The thing hat makes engines work, trees grow, men walk and bombs explode was known to scientists as energy. Einstein's theory was simple: "Every object on Earth contains energy, and all matter and all energy are equivalent, so, matter is just energy in static form." In 1905 Einstein started the research that would lead to the control of atomic energy, 2500 years since Democritus' theory and almost a century since Dalton's first scientific explorations. Einstein was the first scientist to understand that matter was "frozen" energy. But, 40 years after the birth of his theory, atomic science has developed at vertiginous speed. Men of science had discovered that solids, liquids and gases, in other words, everything, was either an element (the simplest substance) or a compound, formed by two or more elements; or a mix, in which two or more elements exist but remain separate, such as sand and water. The "buildong blocks" of elements were single atoms. The building blocks of compounds were molecules, made of two or more atoms linked by electric attraction. For example, when we burn a piece of paper we extract thermal energy form the combustion , i.e., a chemical phenomenon that gives out light and heat. According to Einstein, matter is energy in its latent or potential state, that will turn into kinetic energy , that is to say, the energy of movement when it is released. Men find God behind every door the science manages to open. Imagine a piece of wood, a solid element, hard, opaque, it cannot be bent and seems to be a rigid structure. That same piece of wood, at atomic level, is made of millions and millions of atoms that have a certain cohesion and that results in a structure of this sort, dense. If one takes into account that the particles that compose an atom exists in a proportion similar to that of the sun and planets of the solar system, we realise that the greatest part is empty. That is equivalent to say that if we could see this same object at atomic level, it would not have the same static shape, it would be mostly transparent, similar to a multitude of small particles in constant movement that act and react between them keeping a certain cohesion. It is only fair to acknowledge that eastern philosofy is very advanced, for thousands of years it has been dealing with the unreality of objects, saying that everything is fictional and that objects are only useful to live certain experiences. When we see a tree we say: "Its leaves are green". That is our daily reality. We are not aware that the colour the tree is showing is the one it reflects, the one it "doesn't want", the one it "rejects", because it only allows the rest of the colours of the visible spectrum to enter its molecular structure, those colours are the representation of the range of frequences that solar radiation needs to perform photosynthesis. The colour it shows is only its reafirmation as an species in the enviroment that surrounds it. So, what is reality? the green that we see o the range of frequences represented by the rest of the radiations from the spectrum that allow the tree to continue living? Nowadays, physics are asking themselves is the world we call real is something as concrete as we perceive it,or on the other hand, it is the holographic perception of a great number of elemental particles that order themselves through our human inference. If we cannot perceive reality directly, is there a reality at all?, and particularly, when we cease to perceive it (smell it, taste it, look at it, measure it, evaluate it, etc) does it only continue existing as an intangible sensation that loses shape with time? 1. If I don't recognize a phenomenon, if I am not aware of it as such, the it means it doesn't exist in reality? 2. Does the phenomenon exist only when I perceive it? 3. Is what I perceive the real world? or is it just "my real world"? 4. My real world is just my present moment? 5. Is eternity contained in every instant of my present moment? 7. Can I become aware of eternity? "There is no reason to wait for a definition of the reality that surround us that could be at least reasonable"
This is the same for any other object, mass or form in the Universe; and from this, one can discover, in a way, the concept of energy that is enclosed in material substances. Including every forms in the mineral, vegetal, animal and human kingdoms. It is also important to say that in psychology every idea brings with it energy or vibration. In every emotion, in every feeling of love, hate, pleasure, etc, there is the impulse to take action, or in other words, an energetic aspect. There is no such thing as an isolated idea, a pure representation. Every idea brings with it a force, energy or vibration that is added to the idea by the entity that generates it. It is the vibratory vehicle of the idea. It is much more difficult to measure and establish comparisons in the field of human energy, because these energetic levels are much more subtle that the levels at which the physical instruments work in lab tests. It is easier to work with atomic energy that with human energy because this last one is much more subtle. We shall then establish that all the mentioned types of energy (and many more) exist in the human plane as well as they do in the field of physical objects, and they always exist in the same, never-ending status of action and reaction. Solid, liquid and gas are the three more familiar and recongnized forms. What does physics have to say about this? That the differences between the three forms are caused only because of the millions and millions of small energetic particles that are, in fact, kept in place because of the action of certain forces. So in solid form the cohesive forces are considerable and this gives the consistent solids their particular shapes. In liquid form the interatomic (ot intermolecular) cohesive forces are weaker than in solids. A liquid can assume any shape, precisely because they have little cohesion. And how can we modify those cohesive forces? Through energetical phenomena, which is logical since to actuate upon a force another force is needed. Example: By heating a solid (any metal per example); we are giving thermal energy to it, that energy dissociates it, and as a result the metal becomes liquid. As to the gas form, the repulsion forces are stronger than the cohesion ones, and because of this every gas will expand to occupy all the space available. It is easy to pass from liquid to gas form by delivering thermal energy as well. Matter in gas form is much more subtle than solid or liquid, especially for physical perception. There are two more forms of matter, recognized by traditional modern physics. These are: plasma and ether. Plasmatic form has been observed through radiotelescopes, and other ideal procedures, in some transcendental phenomena in the Milky way galaxy and some constellations. This observations have been mainly of radiations that have been received from either the galaxy or the constellations. Up til now the form of those bodies or nebulas has not been determined, and it is supposed that they are not in any of the three known forms of matter. The information received through the radiotelescopes and special sensors has determined that in those areas the temperatures are extremely high, in the order of hundreds of millions centrigrate degrees, aproximately. So, in those high temperatures, it is supposed that matter takes that particular form that has been named "plasmatic", because it is thought that there is where future galaxies, solar systems or planets are shaped. The other recognized form of matter is "ether" that has been enunciated and considered form many milleniums. The scientific western definition of ether appeared in the past century, when the first wireless inventions and radioelectric communications began to appear. That is, when it became possible to establish a communication between two points that were not, previously, linked, there appeared the necessity to admit that there was "something" in space that worked as a conductor. If that had not been the case there would have been no logic to the process. So it became necessary to admit that there was a subtle agent, a conductor that linked the sender of the radioelectric wave and the receiver. And the name ether was reluctantly given to this agent. Why? because, ether had been mentioned and used by eastern medioeval alchemists, that had started using the name. This subtle energy had been known to many schools since the most remote antiquity, and had been always considered or mentioned every time the transmission of messages using the psychic elements that, as senders and receivers of energy, every human being possesses, and can develop if he or she undergoes the necessary preparations. So, ether has always been known, measured, considered and even used by all the civilizations and by present day science. It is only necessary to mention an experiment made by the Soviet Union, they sent an astronaut with psychic capabilities to space so that he could transmit a message to another person with psychic abilieties here on Earth from behind the moon. Some drawings the astronaut made in space where reproduced on Earth by the other gifted person. This demonstrated that thoughts or ideas can pass through solid bodies. How was the world made? and what is it made of? The first men that tried to find the answer to this question where the greeks, who made an effort to find explanations, according to their logic, to every mistery of nature. Some of them reached strange conclusions. Aproximately in the year 600 B.C., Thales of Miletus, a greek philosopher, stated that water was the substance that made the seas, and every liquid thing, another substance more solid, was what composed harder things, like stones, etc. Little after that, another greek thinker announced that Thales' theory was absurd: it was evident that everything was made of water and air. Another man proposed that the primary element in the world was air, and he was in turn proven wrong by someone that affirmed that objects were made of fire. The situation continued like that, and every theory was succeded by a new one. Years later, Democritus said - Earth, sky, oceans, plants and every human being - were made of very small particles, grouped tightly like bees in a hive. Democritus called this particles "atoms", a greek word that means "indivisible", in other words, that cannot be separated. As we know now Democritus confused atoms with what we nowadays call molecules, but he was headed in the right direction when he thought that they were extremely small. Now we know that molecules are tiny masses made of atoms. Atoms and molecules are so small that is very difficult to imagine their size. John Dalton, an english professor, was the one to discover the key to the question. 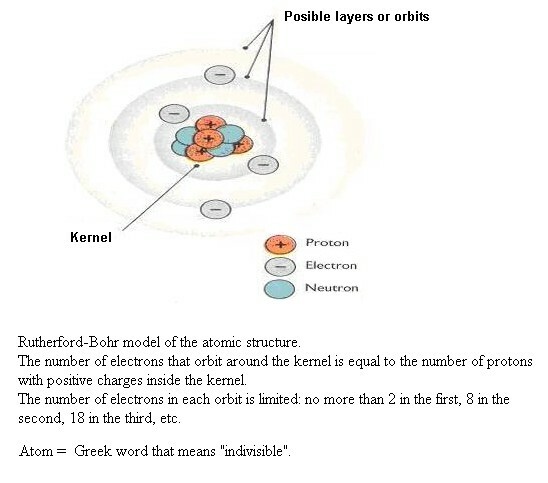 The explanation was in the concept of atom, Democrito's antique theory. Dalton knew that when several elements were observed in the microscope, crystals in different shapes appeared. Gold crystals always had the same shape, the same happended with copper crystals, but gold and copper crystals were very different form each other. So, he arrived at the conclusion that the atoms of every substance had to have the same characteristics: all the atoms of gold were related, the same happened with the atoms of copper, but the two differen kinds of atoms did not have similarities. Compounds, such as water, had to be regular groups of atoms of different kinds. Water turned out to be a combination of atoms of oxygen and hydrogen. And, said Dalton, the reason why eight grams of oxygen always combine with one gram of hydrogen must be that eight grams of oxygen must have the same number of atoms that one gram of hydrogen. So, Dalton concluded, water is made of an enormous number of double atoms, one atom of hydrogen combined with one atom of oxygen, where this one is eight times more heavy than each of the hydrogen atoms. It was a simple and marvelous idea. Without this impulse in the right direction science would still be stumbling in a path of confusion. Thanks to this theory he formulated, Dalton is considered the founder of the modern atomic theory. Chemists shorten the names of the elements denominating them by their initials, oxygen and hydrogen are known by the letters O and H. Dalton had suggested that water was made of HO, thus expressing an atom of H and one O. Avogadro had discovered that the correct formula was H2O. The grouping of the atoms was more complex than what Dalton had thought. And much later it was discovered that in other substances it was yet even more complex. A molecule of sugar, per example, is composed by 45 atoms: twelve carbon atoms (C), twenty two hydrogen atoms (H) and eleven oxgen atoms (O). Written in scientific form that is : C12H22O11. Such groups of atoms needed a new name and Avogadro named them "molecules" or "little masses". "What is the world made of and how is the world made of?" All matter is made of elements and compounds. Elements are made of molecules and atoms. Compounds are made of different kinds of atoms gruped in molecules. In the fifty years following Avogadro's experiments, much was discovered about chemistry and physics. It was discovered that atoms and molecules are always in movement, that they travel a lot in liquids and gases and the merely vibrate in solids. Many new elements were discovered. Each one of course had its own atom, and each had its own weight different from the others. Since Dalton's discoveries, men of science had been wondering about the force that kept the different atoms together in a molecule. Now, it appeared that the force was electricity. For the first time, researchers started to think that atoms could have electrical charges. Atoms themselves are neutral, they don't have positive on negative electrical charge. But inside them both kinds of electricity exist, of course in the same amount. Greece, besides creating the term "energes", from where the etymology of energy, as famous as unknown, comes from, has also provided definitions of energy in its purely phylosofical aspects. Those were not technological times, and then Philosophy was more important than aesthetics and technology. Great Masters of Thought, such as, Pythagoras, Socrates and Plato, talk about energy in their own languaje and expressions. The thing is one must interpret what they express, because they did not communicate in today's languaje, one must make an effort in their direction, that is to say, we must try to get closer to their reality to understand them. When this Masters mentioned the subtle manifestations of energy they often used allegories. If we had to explain what happens with a liquid when it evaporates, for example, we could say that it becomes softer, more tenuous, more vapoury, more subtle, indivisible, intangible, more spiritual...why not? Everything would depend in the particular meaning we would assign to the word "spiritual", this meaning could have been the same thousands of years ago than it is now. Of course, two thousand years later, humanity can believe that those were little more than fancies of those great Masters that liked to say that anything could have spirit. Actually, they meant it in another sense; they used the adecuate words from a philosophical point of view to indicate that subtle, undetectable part that cannot be perceived by our five senses. So, we can assume that these allegories were wrongly interpretated in the following years, because it is difficult to interpret special events with a material frame of mind, in a time when technology dominates over philosphy and aesthetics. There is no sense in comparing or critizing from an ordinary point of view. It is necessary to understand that, to be able to interpret the languaje and the symbols used by philosophers, artists in their times and scientists and technicians nowadays the elements must be placed appropriately within the context of space and time. electromagnetism m. Aspect of physics that studies electric and magnetic phenomena, unified in only one theory that, based in four vectorial equations, stablishes the relationship between the electric and magnetic fields with the electrical charges and currents that act as sources of those fields. These four equations are known as Maxwell equations and they make up a complete description of the electromagnetic field and its interaction with matter. Through them the relationships between electricity and magnetism can be deduced: induction (Lenz's Law), per example, because of which a magnetic field with variable flux creates an electric current and the reverse phenomenon that consists in the creation of a magnetic field by an electric current (electric charges in movement). There are three cerebral organizations or systems, that act independently in a certain way. These are the encephalon, the set of plexuses and the vertebral column (backbone or spine). Between every cerebral organization and in each part of it there circulate bioelectrical currents, pulses or electromagnetic waves, so magnetic fields exists as a result of these impulses. Technically, electromagnetic fields that form the afore mentioned electromagnetic body or "etheric body". Laws of Physics. Electromagnetic theory. The theories of electricity and electromagnetism were investigated simultaneously towards the end of the eigtheenth century and the beginnings of the nineteenth. In 1831, after Hans Oersted started describing the relationship between electricity and magnetism, he described that electric current that flows in a wire induces a magnetic field around the wire. The frenchman André Marie Ampére followed by the french physicist Dominique François studied the same area in depth and the british scientist Michael Faraday discovered that the movement of a magnet in the proximity of a wire induced in it an electric current; this effect was the opposite of the one discovered by Oersted. The complete unification of these theories was achieved by the british physicist James C. Maxwell, that predicted the existence of electromagnetic waves. The activity centers are, logically, in those areas were nervous tissue is more concentrated, because there more electric circuits and currents or impulses will exist. This leads us to understand that the centres of activity exist as a consecuence of the different cerebral organizations, plexus and internal secretion glands that give origin to them. In all these areas there is a lot more electromagnetic activity. Considering in particular the sensorial centres, and analyzing them from the bioenergetic point of view, we can stablish that some of the infinite kinds of external energies interact with our senses. These energies, that come from the world around us, are made of vibrations, chemical reactions, physical phenomena, etc, and in every case they produce particural signals. Thermons and Rigons : they are related to the stimulus of heat and cold respectively (from the greek "Termos"= heat and 'Rigos' = cold). Lets continue analyzing our physical body and its principal systems. Anathomy describes two nervous systems: the central one and the sympathetic. The sympathetic system, that consits of two cords that extend the length of the spine on each side of it (spinal cords) and somewhat in front of its axis. 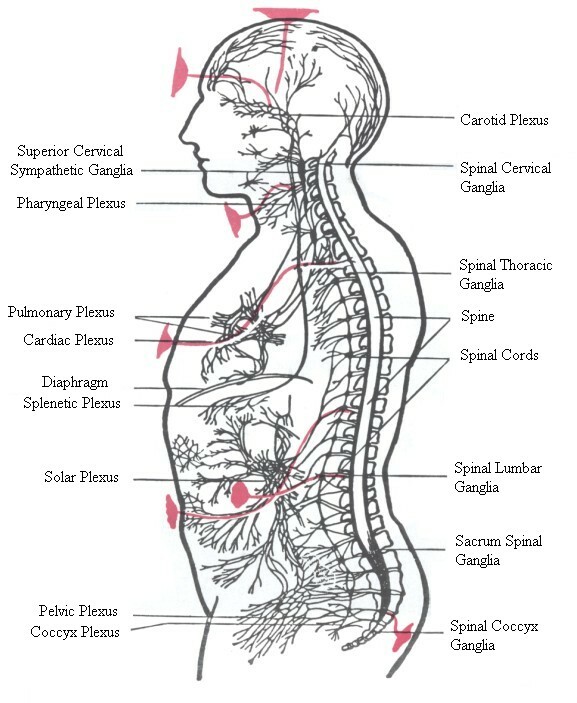 From the ganglia of these two strings, not so many as the ones in the vertebral column, are born the sympathetic nerves that in their turn form the mayor ganglia or Plexuses *(1), from the sympathetic nerves there derive other nerves that from minor ganglia with the nervous terminals. Nevertheless, both nervous systems are related by several mediums and so great a number of conectivity nerves that it is not possible two consider them independently. Each of these mayor ganglia or Plexuses of the sympathetic nervous sistem are senders and receivers of vibratory activity. *(1)Plexus - A net of several nervous filaments intertwined. Every Plexus is related to a Chakra *(2) or etheric vibratory centre (magnetic field) that works as a link between the inside of our physical body and the outside. For example, solar radiation "touches" one of the chakras and through it in turn it actuates over the corresponding Plexus that receives it modified to fit its needs. In other words, Chakras not only work as a link but they also modify the vibration (energy) coming from the outside to the physical medium that must receive it and, in its turn, adapt the vibration coming from the physical medium and sent it into the outside. (2)*Chakras - Wheel : in sanscrit, also known as vortice. The name comes from the fact that the vibrations in these centers go round permanently like a wheel. 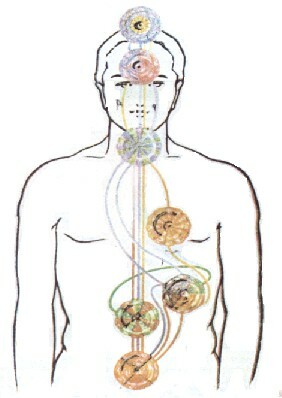 In the central nervous system there is only one chakra named "Crown" chakra, that is in the top center or our head, although it is not related with any of the plexuses of the sympathetic system, it is related to the pineal gland and the pituitary gland and it is involved in the development of this system. Any person that posseses the gift of /clarivoyance/ can see this wheels or vortices in our etheric body or aura. This body can also be registered by Kirlian cameras. 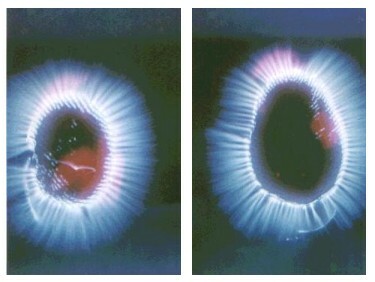 ****See Note on the "Kirlian Effect". Both this systems we have described attend to two fundamental aspects of our being: the central system attends our mental part, with the Crown Chakra, and the sympathetic system attends to our emotional part and the senses with the other six Chakras. Up to now we have studied that we exchange vibrations (energy) with the outside. In the next paragraphs we will expand on these concepts. Through this vibrational exchange we can explain the influence of our human activities in two aspects of our lives. Per example: when we receive very good or very bad news our cardiac part is shaken, and in some cases cardiac attacks can happen. Haven't we heard people say "my heart feels happy" or "my heart is suffering"? This means that we are exchanging vibrations through our Cardiac Chakra. Does't our body feel bad, don't we feel pain in the pit of our stomach when we are in a heavy athmosphere or in the presence of a negative or inharmonious person? In these cases we are exchanging vibrations through our umbilical Chakra. When we emit a thought or idea we are exchanging vibrations through our crown Chakra. After everything we have studied we can define the following: besides our visible physical body we have a mental body formed by the crown plexus and its respective chakra and the invisible physical vibrations that are part of it, that interact with the mental plane and we also have an astral body or emotional body that is formed by the sympathetic plexuses and their respective chakras and the invisible physical vibrations that are part of it and interact with the astral plane. The mental plane is where the mental vibrations are located according to their respective vibratory frequence and the astral plane is where the emotional and sensory vibrations are located also according to their frequences. That is to say we have a visible physical part, body, and an invisible part, spirit or soul formed by the mental, sensory and emotional part. The soul or spirit has life, spiritual life, and the body also has life, physical life. it is therefore true that there is an infinity in number. But we do not know what it is. It is false that it is even, it is false that it is odd; for the addition of a unit can make no change in its nature. Yet it is a number, and every number is odd or even (this is certainly true of every finite number). So we may well know that there is a God without knowing what He is. Is there not one substantial truth, seeing there are so many things which are not the truth itself? We know then the existence and nature of the finite, because we also are finite and have extension. We know the existence of the infinite and are ignorant of its nature, because it has extension like us, but not limits like us. But we know neither the existence nor the nature of God, because He has neither extension nor limits. Now, I have already shown that we may well know the existence of a thing, without knowing its nature." Don't all this wonders studied up to now depend on a Superior aspect that creates them and vibratorily keeps them? Isn't this Superior aspect the Divinity that we call God, Supreme Being, Divine Entity, Nature, Superior Mind, etc? The etheric body hat surrounds our physical body can be seen in this photos taken with the Kirlian camera like a vibratory extension of the latter.